If you like unusual plants, you'll want to add Sundew Plant to your collection. Its other-worldly foliage and strange eating habits make it a fascinating carnivorous plant for the collector. 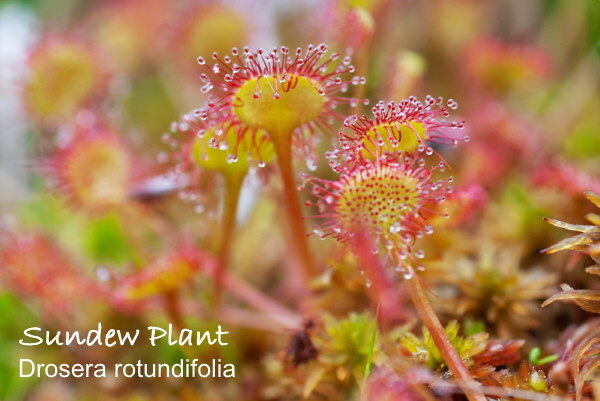 Sundew features long leaves that grow in a rosette. Round, disk-like leaves are covered with red glandular hairs -- or tentacles -- that secrete a sticky juice, luring flies and other insects. Fooled into mistaking that glistening liquid for nectar, bugs are attracted to them. As soon as the bugs land, they're stuck. Then the action starts: As the insect struggles, the leaf seems to gobble it, holding the bug with its tentacles and smothering it. Sundews produce a digestive enzyme that breaks down protein from the insect so that it can be absorbed by the plant. 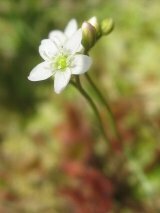 You can expect small, white flowers to appear in summer, rising above the rosette on tall stems. Each flower is short-lived, but you'll get dozens of blooms from healthy plants during the growing season. Wait for flowers to dry and you can collect their seeds -- they're viable and ready to sow for more Sundews (see "Propagation" below). Sundew Plant loves lots of moisture and flies. Give it what it wants and you'll watch it grow quickly, producing more leaves and flowers. Keep up the humidity. Native to bogs and marshes, this carnivorous plant prefers higher humidity than is usually found in a home. It's a good idea to place it in a terrarium or Wardian case to maintain humidity around it. Give it a winter rest. Sundews are perennials that go dormant in winter and need a cool rest. Keep your plant moist and cool during dormancy, with temperatures between 32-50°F/1-10°C (it will tolerate some frost). Moving it to a garage for the winter may be ideal, just be sure it gets some light. Dying leaves? It is normal for dropped leaves during the winter rest, and Sundew Plant will grow new leaves in spring and summer. Hot temperatures can cause dormancy, so if this happens, don't give up on it. With good care, it should bounce back. This is a temperamental plant that doesn't like extreme heat, direct sunlight or dry conditions, so if it dies don't feel badly. It's a good idea to save the seeds, so you'll have more plants. More Bug Gobblers: If you like Sundew, you may want to explore these carnivorous plants, too. Venus Fly Trap, California Pitcher Plant and Pitcher Plant. Water: Aim to keep the potting medium evenly moist. Never let it dry out completely. Humidity: Moderate to high. If the relative humidity drops below 50%, you'll want to raise the humidity for your plant. Temperature: Cool to average room temperatures 60-75°F/16-24°C; In winter, a cold rest is needed 32-50°F/1-10°C. It will tolerate a little frost. High heat may cause dormancy, so it's best to maintain normal room temps for it. Fertilizer: Don't fertilize because it will burn the roots and may kill the plant. Since sundews are unlikely to catch insects in the house, you can feed it dead flies spring through fall. Don't use flies that have been exposed to insecticide because it will damage the plant. Propagation: Seeds or division. Collect seeds from flowers that have dried and sow them in peat moss (kept moist at all times). Place the pots in a warm window or under fluorescent lights. Seeds germinate in about 2-4 weeks. To divide, separate new rosettes that form around the parent plant.